The first study to compare brain function between humans and any nonprimate animal shows that dogs have dedicated voice areas in their brains, just as people do. Dog brains, like those of people, are also sensitive to acoustic cues of emotion, according to a new study in the Cell Press journal Current Biology. The findings suggest that voice areas evolved at least 100 million years ago, the age of the last common ancestor of humans and dogs, the researchers say. It also offers new insight into humans' unique connection with our best friends in the animal kingdom and helps to explain the behavioral and neural mechanisms that made this alliance so effective for tens of thousands of years. "Dogs and humans share a similar social environment," said Dr. Attila Andics of MTA-ELTE Comparative Ethology Research Group in Hungary. 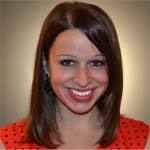 "Our findings suggest that they also use similar brain mechanisms to process social information. This may support the successfulness of vocal communication between the two species." 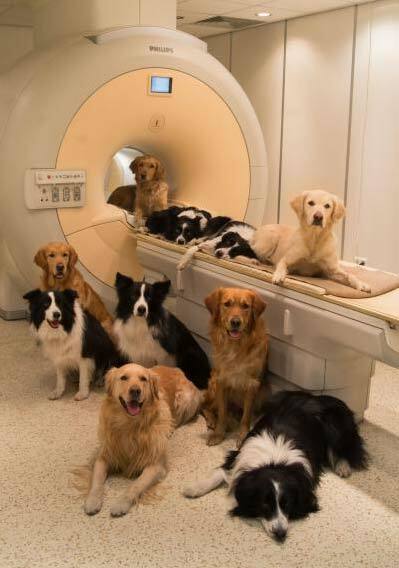 Dr. Andics and his colleagues trained 11 dogs to lay motionless in an fMRI brain scanner. That made it possible to run the same neuroimaging experiment on both dog and human participants—something that had never been done before. They captured both dogs' and humans' brain activities while the subjects listened to nearly 200 dog and human sounds, ranging from whining or crying to playful barking or laughing. The images show that dog and human brains include voice areas in similar locations. Not surprisingly, the voice area of dogs responds more strongly to other dogs while that of humans responds more strongly to other humans. The researchers also noted striking similarities in the ways the dog and human brains process emotionally loaded sounds. In both species, an area near the primary auditory cortex lit up more with happy sounds than unhappy ones. Dr. Andics said the researchers were most struck by the common response to emotion across species. There were some differences, too: in dogs, 48% of all sound-sensitive brain regions respond more strongly to sounds other than voices. That's in contrast to humans, in which only 3% of sound-sensitive brain regions show greater response to nonvocal versus vocal sounds. The study is the first step toward understanding how it is that dogs can be so remarkably good at tuning into the feelings of their human owners. 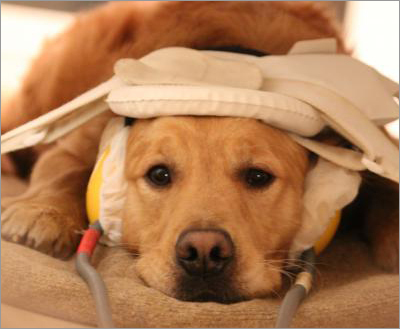 "This method offers a totally new way of investigating neural processing in dogs," Dr. Andics said. "At last we begin to understand how our best friend is looking at us and navigating in our social environment." I like knowing that we are not to dissimilar to our K9 friends. BTW, how come that first Collie dog on the scanner looks so wiped out? !